Joe’s Wx Blog: What’s 3 Million Miles Between Friends? After some beautiful weather yesterday evening for all the area fireworks displays, today is turning a bit more typical at least from a temperature standpoint with readings now int he mid 80s and we’ll certainly tack on a few more this afternoon as readings approach 90° in spots. Interesting to note that today was the 1st day with lows as “warm” as the 60s in KC. In other words the 1st 4 days of the month were in the 50s for lows…the only time that I can find that happening was back in 1924, where the 1st 4 days of the month were also in the 50s for AM lows…so this type of thing is pretty rare. Even down into NE TX it’s still pretty “dry” from a dewpoint standpoint, it should be a lot “juicier” here and especially down there. So even south winds will take a bit of time to siphon some richer gulf moisture up to our area…but this will slowly occur over the weekend. Rain chances: Strangely while many will stay dry, there is actually some weird ways there could be at least some scattered showers out there this weekend. For the last several days there has been this area of clouds/moisture to our west on the KS side…that area will migrate slowly east tonight into Sunday AM…from that little area there have been at least a few VERY random showers overnight lately and I can’t totally rule out something tomorrow AM and again on SUN AM. At this point my feeling is that the chance of any one spot getting rain is under 20% but it is something for me to pay attention to over the weekend. Monday: Here it gets a bit more complicated. The heat will be building in, but aloft there will be weird small-scale disturbances that could 1) trigger clouds and 2) perhaps trigger some scattered showers or t/showers moving to the ESE. here is a look at the MON PM forecast off the NAM model…look at those little areas of “vorticity” represents by the yellow/red colors in the Plains states. Now the model won’t be correct in the exact placement of these features but it’s indicative to me that there is a “pattern” that would favor storms to come off the Rockies and leave remnant areas of broad spin in the atmosphere (vorticity) that could trigger renewed rains. The flow farther aloft is also somewhat diffluent (the air spreads out allowing the air below to rise to fill the void creating rising air motion)…so it’s something to pay attention too. 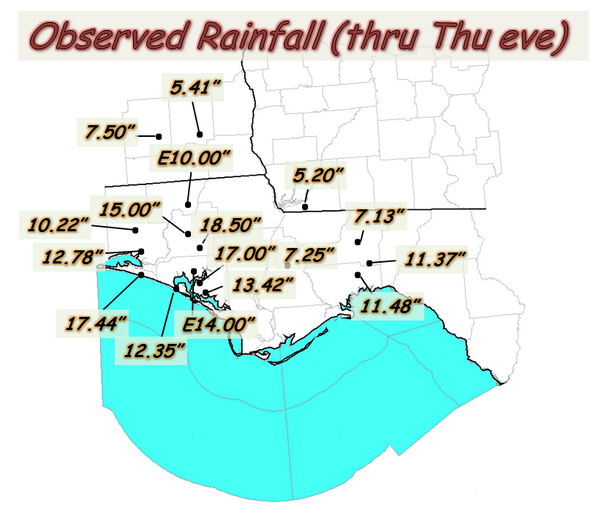 Speaking of rainfall…remember yesterday I talked about all the rain in the FL Panhandle area…check out this graphic from the NWS down there…this is how much they’ve had in the last few days! Now that July is here, it may interest you to know that we’re actually farther from the sun now than we are in December. That may not make sense to you because you might be asking yourself, “if we’re farther from the sun now why is it hotter in July?” It’s because of the tilt of the earth. Since the earth is tilted on it’s axis, right now the north pole is tilted towards the sun, since we’re in the N Hemisphere so are we…and that’s why it’s hotter now than when the earth is closer to the sun in January. As a matter of fact today the earth is some 94.5 million miles from the sun, whereas in January we’re about 91.4 million miles from the sun, a difference of almost 3 million miles or about the distance if you were go go around the earth 120 times! In the winter months when the earth is closest to the sun and we are colder it’s called perihelion. By the way before I leave you there are decent signs that some pretty decent to strong signs that real heat may build into the region NEXT weekend…we’re talking 95-100° potential I think…how close we get to 100° may be determined by whether we get a dose or two or three of rainfall and how green the terrain is or IF we’ve drying out on a widespread basis. Just another heads up about the potential.